This home was built on a lake for a family that used it as their vacation home, but it would work perfectly well as a year–round residence. The house has a side entry, allowing it to fit easily on a narrow lot. Bedrooms 2 and 3 face the road, and you enter from the left side (or the right side if the plans are reversed). The entryway has a coat closet set into an angled wall. Beyond the closet on the right, sliding doors provide access to the two bedrooms and a full bath that they share. To the left from the foyer you pass a small laundry closet as you enter the main living areas, which are all open to each other. The kitchen features a large island with a stove on top and a curved edge for casual dining or serving. Across from this counter there are stairs to the upper and (optional) lower level. The ceiling over the living and dining rooms rises to a stunning 20', and features exposed beams. 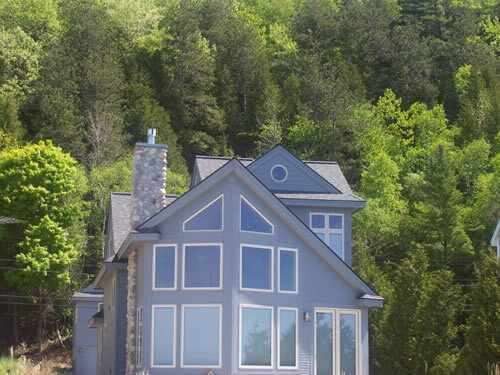 There are two levels of windows providing spectacular views to the rear and side from both the main and upper levels. A large wood–burning fireplace on the living room wall can also be enjoyed from the kitchen and the dining area. A large glass door brings you to an enormous deck that wraps around the entire living space. The entire upper level of the home is dedicated to a spacious master suite. It has a vaulted wood ceiling in the bedroom, with large wrap around windows for light and views. There's also an extra large walk–in closet off the bedroom. There's a lovely balcony off the master bedroom that overlooks the living room and dining room, and enjoys views through the upper windows. Note that the original home was designed with stairs leading down to a tall, but not stand–up, crawlspace. This feature makes the addition of a full height basement level fairly simple, if desired. If a basement is not added, this space can be used as mechanical or utility storage. A separate set of plans for a detached garage is available for this house. The plan name is Coastal Home Garage, and the ID number is EK-010. If you purchase the garage plans at the same time that you purchase the plans for the house, the price shown for the garage plans will be reduced by 50%! You’ll need to place your order by phone to receive this reduced rate. 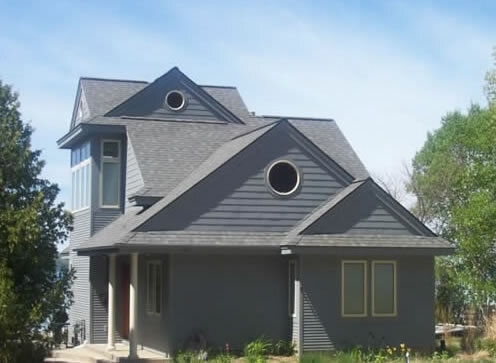 Interesting angles and shapes add architectural appeal and character to this unique home. 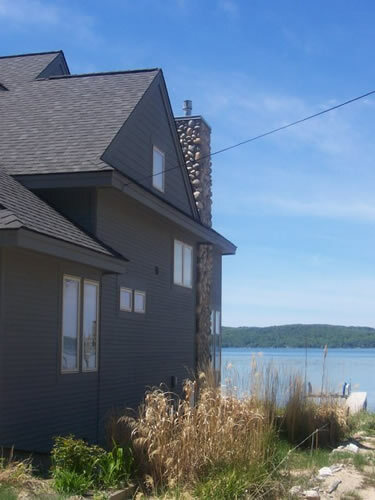 The exterior of this rugged design is a combination of plank siding with cedar shingles above, painted metal roofing, and rough sawn cedar corner posts and trim. 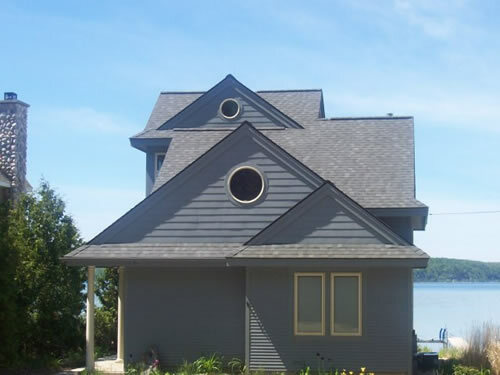 Round accent windows, and the pointed end of the home (like the bow of a ship), are designed to fit in a waterfront location, but clearly would be at home overlooking any view.